Today’s swatch is yet another Blue Eyed Girl Lacquer, but it’s one I love a lot. 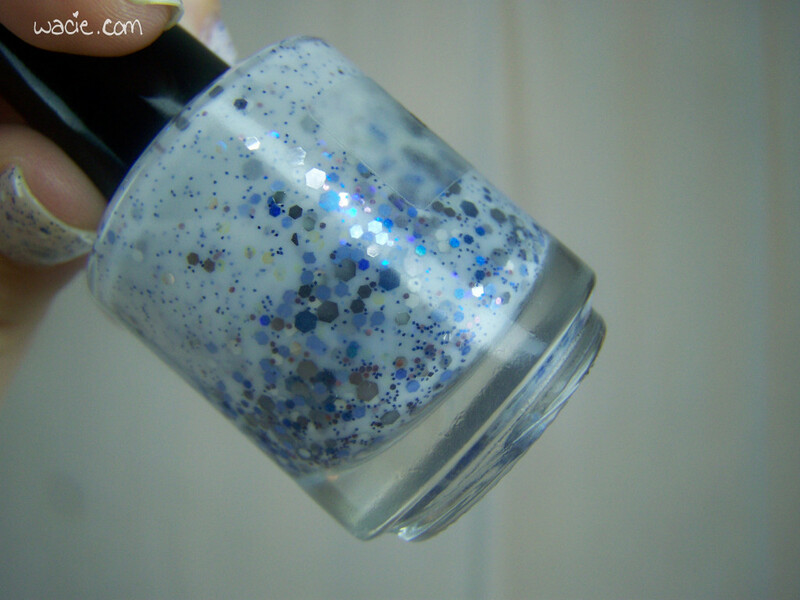 First Frost is a white jelly/crelly with tons of blue, silver, and gunmetal gray glitters. I’m wearing three coats of it with three coats of top coat. I really do adore this polish. There are so many beautiful glitters, but it’s such a soft look. Given the translucence of the jelly, this almost looks kind of pink on me (it’s more evident in person, I think), but it’s totally not. It’s my nail. While I work from home and have a skewed idea of what’s work-appropriate, I’d say this one is. It’s pretty and glittery, but it can’t be seen from the other side of the room. The name is also evocative of gray skies and light, fluffy snowfalls, the wintry smell of the air and the crush of frozen ground underneath one’s boots; these are things that, as a Floridian, I know absolutely nothing about. These were really hard to clean up, and as you can see, I did a horrible job. I tried getting the fine glitters away from my cuticle, but I ended up just making my cuticles dry and sad. I’m kind of embarrassed to post them like this, but the polish looks so awesome I almost don’t even care. Sadly, First Frost has been discontinued, but there are some similar white crellies in the BEGL store. One of them is a discontinued limited edition that’s on sale, you may want to get on that before it’s gone. This entry was posted in Swatch Saturday and tagged blue, Blue Eyed Girl Lacquer, glitter crelly, glitter jelly, indie, swatch, white.